NOTE: At the moment WikiLeaks is not accepting new submissions due to re-engineering improvements the site to make it both more secure and more user-friendly. Since we are not currently accepting submissions during the re-engineering, we have also temporarily closed our online chat support for how to make a submission. We anticipate reopening the electronic drop box and live chat support in the near future. Wikileaks will accept restricted or censored material of political, ethical, diplomatic or historical significance. We do not accept rumor, opinion, other kinds of first hand accounts or material that is publicly available elsewhere. This is because our journalists write news stories based on the material, and then provide a link to the supporting documentation to prove our stories are true. It’s not news if it has been publicly available elsewhere first, and we are a news organisation. However, from time to time, the editors may re-publish material that has been made public previously elsewhere if the information is in the public interest but did not have proper news analysis when first released. If you are sending us something, we encourage you to include a brief description of why the documents is important and what the most significants parts are within the document. It will help our journalists to write up and released the story much faster. 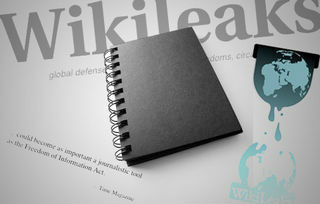 Wikileaks has an anonymous electronic drop box if you wish to provide original material to our journalists. Wikileaks accepts a range of material, but we do not solicit it. If you are going to send in material it should be done as securely as possible. That is why we have created our novel method of submission based on a suite of security technologies designed to provide anonymity. We have put a great deal of technical and design work into the drop box because we take the journalist-source relationship very seriously. Our drop box is easy to use and provides military-grade encryption protection. Submitting documents to our journalists is protected by law in better democracies. For other countries, the electronic drop box is there to offer help and protection. It is particularly designed to keep your identity hidden from everyone, including WikiLeaks. We never keep logs of who uses the drop box or where they are coming from. There are several ways to send in material, but the most secure and anonymous is at the following link. To add another layer of protection,you might also want to use the secure TOR network (http://suw74isz7qqzpmgu.onion/) Tor is a secure anonymous distributed network that provides maximum security. You can also chat to us online and we will answer any questions or solve any problems you might have with submitting (https://chat.wikileaks.org) (Currently temporarily closed with the electronic drop box for re-engineering.) Our chat is designed to be secure and anonymous. Visitors are protected by many layers of security. They can not see each other. There is a mechanism in place to stop logging and the server forbids potentially dangerous commands that could reveal other user’s identity. Communication is secured with SSL encryption. Wikileaks does not record any source-identifying information and there are a number of mechanisms in place to protect even the most sensitive submitted documents from being sourced. We do not keep any logs. We can not comply with requests for information on sources because we simply do not have the information to begin with. Similarly we can not see your real identity in any anonymised chat sessions with us. Our only knowledge of you as a source is if you provide a coded name to us. A lot of careful thought by world experts in security technologies has gone into the design of these systems to provide the maximum protection to you. Wikileaks has never revealed a source. When WikiLeaks receives a document, our accredited journalists assess the submission. If it meets the criteria, our journalists then write or produce a news piece based on the document. This typically includes a description of the document, an analysis of why it is important, and an explanation of what it signifies to broader society. The news piece might also highlight the parts of the document that are most newsworthy. Our news stories are deliberately analytical regarding the wider significance of the document. We then link from the news piece to the original submission. Submissions establish a journalist-source relationship. Online submissions are routed via countries which have strong shield laws to provide additional protection to sources and journalists. Some documents submitted contain highly sensitive information. WikiLeaks has developed a harm minimisation proceedure to clean documents which might endanger innocent lives. In other instances, WikiLeaks may delay publishing some news stories and their supporting documents until the publication will not cause danger to such people. However in all cases, WikiLeaks will only redact the details that are absolutely necessary to this end. Everything else will be published to support the news story exactly as it appeared in the original document. WikiLeaks has a overriding objective to publish and bring information into the public arena to encourage an informed society. It will stay doggedly true to this goal. If you want to send us a message of your own, as opposed to a document, please see Contact. Fast, easy and automatically encrypted with the best banking-grade encryption. We keep no records as to where you uploaded from, your time zone, browser or even as to when your submission was made (if you choose a non-zero publishing delay, we set the file time record to be the release date + a random time within that day). If you are anonymously submitting a Microsoft word file (".doc") that you have edited at some stage, please try to send a PDF document (".pdf") instead, as Word documents may include your name or the name of your computer, see Word file redaction for further information. If you have no means to produce a PDF file your document will be converted by WikiLeaks staff. The process your document will undergo is outlined for understanding submissions. NOTE: At the moment WikiLeaks is not accepting new submissions due to re-engineering improvements the site to make it both more secure and more user-friendly. Since we are not currently accepting submissions during the re-engineering, we have also temporarily closed our online chat support for how to make a submission. We anticipate reopening the electronic drop box and live chat support in the near future. Submissions to our postal network offer a strong form of anonymity and are good for bulk truth-telling. First place your leak onto a floppy disk, CD, DVD or a USB Flash Drive. If you are using a floppy disks, please create two as they are often unreliable. If you only have paper documents, we will scan them if they are of significant political or media interest (if you are unsure whether this may be the case, please contact us first). This will delay the process however. Post your information to one of our trusted truth facilitators listed below. You may post to whatever country in the list that you feel most suitable given the nature of the material and your postal service. If your country’s mail system is unreliable, you may wish to send multiple copies, use DHL, FedEX or another postal courier service. WikiLeaks truth facilitators will then upload your submission using their fast internet connection. If you use a floppy disk, be sure to send two for increased reliability. You can use whatever return address you like, but make doubly sure you have written the destination correctly as postal workers will not be able to return the envelope to you. After receiving your postal submission our facilitators upload the data to WikiLeaks and then destroy the mailed package. If your leak is extremely high risk, you may wish to post away from your local post office at a location that has no witnesses or video monitoring. Many CD and DVD writers will include the serial number of the DVD or CD writer onto the CD/DVDs they write. If the post is intercepted this information can in theory be used to track down the manufacturer and with their co-operation, the distributor, the sales agent and so on. Consider whether there are financial records connecting you to the CD/DVD writer sale if your adversary is capable of intercepting your letter to us and has the will to do this type of expensive investigation. Pay cash if you can for the CD/DVD writer. Similarly, CD and DVD media themselves include a non-unique manufacturing "batch number" for each group of around 10,000 CD/DVDs made. Pay cash when buying the CD or DVD. Try to choose a store without video cameras at the register. Although we are aware of no instances where the above has been successfully used to trace an individual, anti-piracy operations have used the information to trace piracy outfits who sell tens or hundreds of thousands of counterfeit CDs or DVDs. If you post it to us, a good option is to encrypt the USB file/CD file and then contact us at a later date via live online chat with the encryptin passphrase. That way if the post is intercepted, the data can not be copied. If you suspect you are under physical surveillance, discreetly give the letter to a trusted friend or relative to post. On some rare occasions, targets of substantial political surveillance have been followed to the post office and have had their posted mail seized covertly. In this rare case if you are not intending to encrypt the data and if the police or intelligence services in your country are equipped to perform DNA and/or fingerprint analysis you may wish to take the appropriate handling precautions. You may post to any country in our network. Pick one that best suits your circumstances. If the country you are residing in has a postal system that is unreliable or frequently censored, you may wish to send your material to multiple addresses concurrently. For unlisted postal addresses, please contact us. To: "WL" or any name likely to evade postal censorship in your country.